FINAL UPDATE - So, here I am, sitting in my own room, in my own house, typing on my own computer. It feels kind of strange after not seeing any of this stuff for 45 days now. The last couple weeks of the trip we visited stadiums that I had been to several times so I was more excited to complete the trip then to see the sites. The excitement of the trip ending started to really take over. To see all the faces I was familiar with, to get back to a normal schedule, to get out of the confines of the BA2K4 mobile and to say that we had finally accomplished a long time dream was starting to become a priority of mine. Now, it's over. The final game had been seen. A month and a half of adventures across the country is no longer. As much as I was looking forward to this moment, I already miss it. We arrived at Petco Park around 5 p.m. and became media sluts as we interviewed with pretty much every news outlet in San Diego County. Thanks to family friend Sue Gibson we were featured a featured story on Channel 4, Channel 8, Channel 9 and a number of other local stations. We were also mentioned on radio shows across the country. Celebrity is kind of a cool feeling. We were all a little tired to do the interviews, but nevertheless it was pretty cool to get some recognition. Seventy-nine tickets had been purchased and seventy nine people showed up for the final game. The excitement among the group was very uplifting as the people who had been following us could be a part of completing this dream. The game was between the Rockies and Padres. The home team lost just as they did when it all started. The game for once wasn't the focal point of the evening but rather the PR we all had to do in telling stories and memories to everyone who wished they could have been with us. Near the end of the game we ran into a lady named Michelle who had seen us on the pregame show earlier in the evening. She claimed that we were her heroes and she had to meet us. She left her home, snuck into the game and did a full search of the upper deck in order to find our group. She eventually found us and showered us with gifts and stories. Her excitement seemed to explode once she met us. After the game, she followed us to the car where she had us sign her shoe (her thing with people she meets) and joined us in the picture taking festivities. It was kind of nice to have my signature on something that was also signed by future Hall of Famer, Tony Gwynn. So, there we were. In the parking lot of what was the finale of our trip. What do we do now? There was a HUGE group of people there to see us add the final decal on our map (which we lost) and see the Baseball Adventure reach its conclusion. We all finished our picture taking, received our congratulations and then it was over. We went home and now, it is tomorrow. I have work tonight and school starts sooner than I think. The games on TV seem so distant but now I realize that every time I watch a game I will have a story of my own of "I've been there" or "That's where I sat" or "When we were there. . ." In my own personal opinion, baseball has come to life even more than it already was. Baseball is now a part of me more than I thought possible. I, along with Jason, Jeff and Tucker have done something that any extreme fan would want to do, and even though we'd all have a few changes, I believe I speak for all of us in saying that it was everything we had expected and more. I already miss it. I miss the overnight drives to make sure we caught the first pitch in Tampa Bay. I miss waking up every morning and packing the car up the same strategic way to make for maximum comfort (if comfort was possible). I miss the fights. Even though Jason probably wanted to kill me the entire trip, I personally feel closer to my brothers than I ever have. We had our ups and downs, but many more ups. The laughs, stories, adventures, and fights all meshed together to form what I can definitely say is the greatest summer of my life. I obviously will never forget this memory and will be sharing its stories for a long time to come. So, Jeff, Tucker and yes, even Jason....... thank you. Thanks for sharing and allowing for me to share with you what I can say was an adventure of a lifetime. I don't think anything in my life can quite compare to what we went through the last 48* days (45 for me, there you go Jason, I got my asterisk). As for now, I have to be at work in the morning, so my bed is screaming my name. But part of me wishes there was yet another game tomorrow. 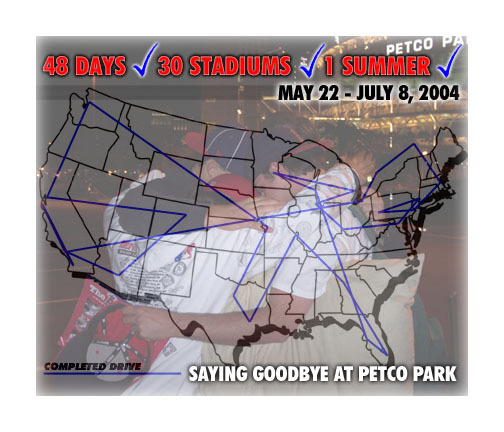 July 9, 2004 7:05 PM PT - Hey guys, we are currently putting together the final photos we took down at Petco Park, along with some final thoughts and updates from our trip. For all you new guests please enjoy our website as much as we did creating it. Last the final group of Miss Baseball polls will be up soon, please check back and vote. The finals will begin July 16, remember top 2 of each group moves onto the finals. June 22, 2004 3:55 PM CT - Group 2 poll of Miss Baseball has been updated and placed on the balloting page. Keep the votes coming. Look back for an update on Texas including both games in Houston and Arlington. Talk to you guys soon.